Editor's Note: Planting a church isn’t easy. There are the highs in reaching out to a new community and lows of hitting roadblocks along the way. That’s where Jerry and Eppie Wyckoff find themselves today. They’re raising support to start The Grove. Since they first applied for The Juicys, the process for launching their church looks murkier. Because of that uncertainty, the Wyckoffs decided not to accept the grant money that comes along with The Juicys. We’ll take that money and give a larger grant to the two runner-up churches in the small church category. The Wyckoffs have generously agreed to still let us share their project. After all, a big piece of The Juicys is education. We always want these projects to be a motivation and potential roadmap for churches looking to improve their communications. The journey for this Juicys winner takes us to Denver, Colorado. It’s a place of tremendous natural beauty, but also an area with a high population of unchurched people. 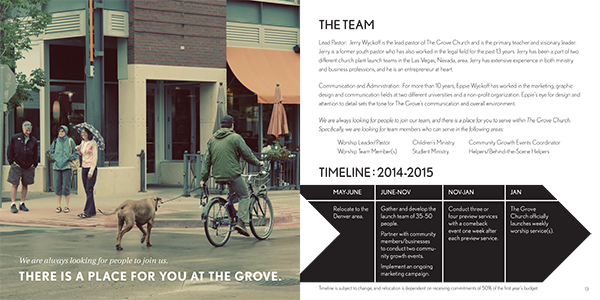 Enter Jerry and Eppie Wyckoff, who are building a team to launch a new church called The Grove. By 2015, they hope to officially start public weekend services. But now, they’re raising support and a key piece of their communication is a print booklet. The look of the brochure, designed by Eppie, definitely follows the trend of using filters to make images feel more retro. It wasn’t a style used on a whim but instead an intentional decision. The future for The Wyckoffs means continuing to build relationships in Denver and sharing a vision of what a church can be. Is there a way to download the Adobe files for this project instead of a PDF? 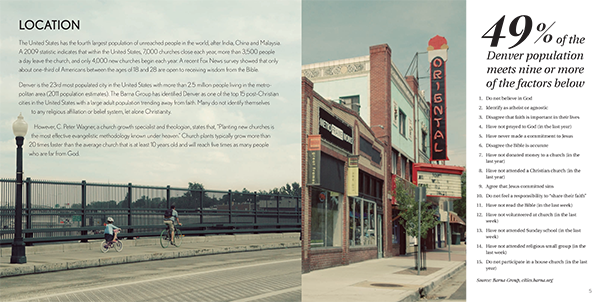 It’s a great brochure! Hi Brent. I’m sorry, but the PDF is all we have.